In her latest piece for WhichPLM (and her first for this year), resident digital printing Expert, Debbie McKeegan, explores the concept of ‘time’: “the most valuable commodity in our modern lives”. It would seem that time is now the most valuable commodity in our modern lives, and the most important asset for commerce. Millions of pounds are spent daily in the pursuit of our time. The crusade for engagement; following your every online step to involve you in a marketing campaign be that Food, Fashion, Leisure, or whatever you are doing. Wherever you are, it is relentless. If you’re on grid then your time is an easy target. And yet, with this incredible tech at our fingertips (much of which we take for granted), have we learned how to create time? Do we actually have more time? Are we more efficient? The correct answer has to be yes …doesn’t it? As a world population we have less time than ever before, and our clients are never truly satisfied – something that applies to all industries. To stay ahead and evolve we must create, manufacture and distribute products more quickly, driving the need for new technology to facilitate speed of production – the first link in the chain, or at least, it used to be. However, for many manufacturing custom made products, the first link is now the purchase that then triggers production. So, what can you do to create time in the supply chain that services your business? Let’s slow down and look at the manufacturing cycle of one basic element, the textile fabric for a garment, as an example. How do we manufacture a piece of cloth? Firstly we need a yarn (cotton, in many cases), which has to grow. No problem: we can speed up growth, but we are still reliant on a good crop and nature can and often does intervene. So we spread the risk, therefore purchasing must be dual sourced globally. For synthetics that’s an easier route as manufacturing is already automated. And so, your yarn is spun, processed and prepped, then woven. It has been transformed into a fabric. From here it can be bleached, singed, dyed, processed for end use and prepared for print etc. It then becomes grey stock awaiting further processing. At this point you are maybe half-way through the manufacturing cycle of just one component: the fabric. Beyond this we have to incorporate Design, Print (I’ll touch on this later), Sampling, Photography, Sales, Marketing, Distribution, Retail and more. I hope I’ve made my point. The supply chain of every garment, whether mass-produced or bespoke, is vast, highly complex, and spanning many continents. The only way to make time here is through automation; the seamless global automation of all base elements is key to the management of the supply chain. But the market demands fast fashion and we must automate every part of the process if we are to deliver. Let’s look at Digital Print as an example of how technology is being utilized to create time. 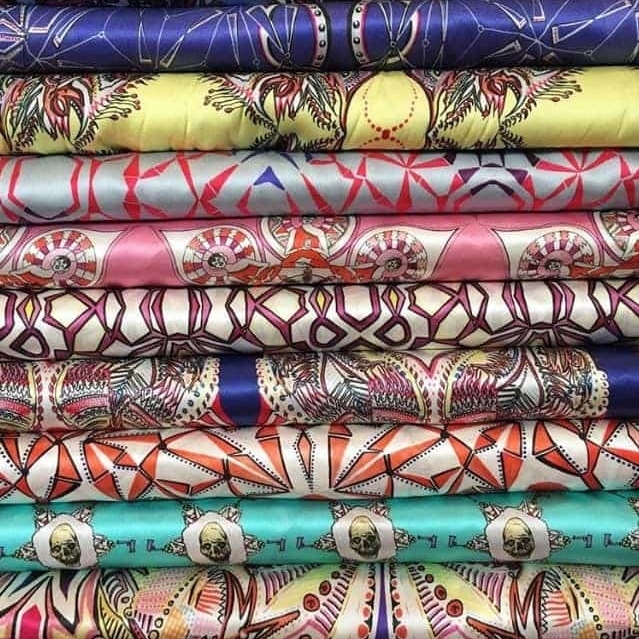 Digital print falls roughly half-way through a garment’s manufacturing cycle. It is firmly established as the preferred route for fast manufacture. In simplistic terms, mainly because the design element is digital, there are no rotary screens needed. Production is indeed instant, and it is really just a question of volume. New technology offers the speed and the stability needed to provide consistency of print, whatever the meterage. SPG Print offers digital machines which can give 5 metres per minute. It’s said that within three to five years it will be possible to print digitally at the same speed as rotary, typically 40 metres a minute. The problem facing us all is that the market has changed. We still consume a high volume of print, but the print run is no longer 10,000m of a single design. This single order may be made up of multiple designs in multiple colourways. This is the printed “fairy dust” (more on this later) of fast fashion, meaning large volume orders for garments with multiple printed design options. To achieve the efficiency needed for the commercial viability of digital production, the artwork and its delivery must be both digital and automated. Pattern, Scale and Colour must all be automatic and pre-set by the design team. Colour management on the print machine must be automatic and self-regulating, with auto colour correction via magic eye and calibration being essential. With this digital print technology we can automate the production process of large and small orders for printed fabric. And, yes, save time …soon! Automation is an essential key element to the future of design. “Fast Fashion” has been a driving factor in our market, forcing the development of new strategies utilizing elements of automation. But the final objective for digital manufacture and process has to be the linking of all of this automation into seamless supply chain management. Let’s remember where we start. We start with a creative, a visionary tasked with a brief to create a garment or collection to be offered for sale. We are in the theatre of Fashion; forget any time schedule from the past decade which was, even then, deemed as fast! This is a turbo charged, fast paced exhausting environment, driven by carefully studied analytics and focused retail strategies. So how does the creative remain energized in this race to the consumer? The design industry must up its game; it’s a challenging, and exciting time for anybody in design. We must fully understand our client’s needs and stay close to them if we are to fulfil their expectations efficiently. Our clients demand good design with instant gratification continually, forever! In the fashion world the theatrical show has never before been so orchestrated. Customer engagement is the driving force, feeding the consumer pipeline with a never-ending stream of enticing offerings for instant purchase and same day delivery. The design cycle is constant, 24/7, 365 days a year, and never sleeps. It’s no longer seasonal. Customers demand new products all year around. Trends in the marketplace are scattered like “fairy dust”. Whilst the core trends, which may last a season, will be axed quickly if they under perform, the need for good quality design has never been greater. And once again the only way to make extra time is to automate. CAD software is an essential element in fashion design, as is 3D rendering and garment augmentation. It’s often neither practical nor necessary to make a sample garment. The fashion designer can depend entirely on software to take the garment all the way to production. With many fashion brands offering their garments for instant sale as they walk down the catwalk, feeding the “see now, buy now” culture, the catwalk is becoming a virtual store. We are all encouraged to participate in the fashion journey via our social media feeds, where we can like, comment and share at any time, day or night, worldwide. We truly have a global voice! But whilst I too love the transparency along with the audience participation, this is actually just a live sale, offering products for fast limited purchase at a premium price, to a highly targeted, engaged and unlimited audience. I can’t help feeling that the consumer is being manipulated, or perhaps they are willing, loyal participants? It is, after all, new stock produced and pre-sold to many of the buyers targeted prior to the show – ,any of whom will have stock to sell in store at the end of the runway. Isn’t this really a fast sale at premium price? The extended manufacture of which will be triggered by social media. This is just one example of the high street and designer brand strategies which engage their audience and time, but they must continue to seek new ways to engage the now online, mobile audience. New technology facilitates this. Customized clothing apps for the mobile millennial generation. Our expectations of technology have never been greater and it seems almost anything is possible if you put your mind to it. Who would have thought that you could customize and purchase a garment on your iPhone? Build your garment online, choose a design and it will be delivered in 2 days – soon to be same day – by drone? And let us not forget automated delivery and dispatch technology, which keeps our customers on track with their purchased item and its exact location and delivery time, in minutes. Apps for creative print design are also highly technical and inexpensive, offering incredible software and CAD techniques or design elements to creatives using mobile applications. Much of this is highly automated at present, however all offer amazing creativity and often for free. Sales and Marketing channels demand content? Design also has a fundamental role in the generation of online content. Retail display and merchandising, magazines etc are now focused online and the marketing driven towards mobile exposure and customer engagement, creating a need for vast archives of imagery for social media applications like Instagram, Snapchat, and Twitter. The social media feed is infinite and the primary focus for many brands and their e-marketing campaigns. Once again, the creative is an essential element in the process. How does the consumer feel about all of this content? As a designer myself I do often wonder how the consumer holds up to the steady stream of tempting delights from the fashion world. How do they absorb all the visual data? Subliminal triggers and content marketing offer the client instant engagement, thus bringing a whole new meaning to the concept of brand loyalty. Limited, fast moving stock encourages the buyer to buy before the item disappears …or so it seems? See now, buy now, need now! So is the consumer ready for the next generation in Retail? How long will it be before we see Virtual stores on our high street? Each streaming virtual life size catwalks, simulated clothes and displays; each retailer holding a small selection of garments, none of which are for purchase in store, just samples. Will the changing room at your local boutique or retailer soon be a body scanner, mapping garments onto your life-size image? Taking measurements so as to electronically transmit to the robotic sewing department who will cut, sew, pack and deliver your customized purchase by drone to your exact GPS location the same afternoon? It will happen, believe me. Will the Fashion Catwalks of the future be augmented reality? Looking to the near future, the next generation of fashion surely must be a garment created in minutes to order? Sold either online, in store by sample or on the runway. The technology is available to do this, but it has to be seamless, fully automated and executable to the mass market. After all, wuldn’t this be more sustainable? Not only saving us all time but also creating less waste. All these tools are at our fingertips, and quite literally whilst using our smart phones we can live in a virtual world that then becomes a reality at the push of a button: the purchase.